A health promotion activity to foster healthy behavior while at work is being advocated by the People Management Association of the Philippines (PMAP). There is a strong connection between wellness and productivity and so employers are encouraged to take interest in their employees' wellness and in the importance of physical activities at the workplace. On Friday, People Management Association of the Philippines is leading the National Wellness Day event where a 7-Minute Wellness Moment, a quick wellness activity that involves stretching and meditation to be done simultaneously across the nation by employees at exactly 3:00 PM. The said National Wellness Day is envisioned to be participated in by various companies in the country, both PMAP and non-PMAP members. Through the years, the organization have organized employee activities like sports fests, family day events and the likes for its member companies. “This time, we want to come up with an activity that will help promote awareness among employers and employees about the importance of being physically, emotionally and spiritually healthy“, according to PMAP Trustee for Fellowship and Wellness Mitch G. Guce. Orgnizations who will join in the National Wellness Day activity are encouraged to document their participation through videos and/ or photos and send a copy to the PMAP Secretariat to be included in the list of companies who will be recognized with a PMAP workplace wellness certificate later on. 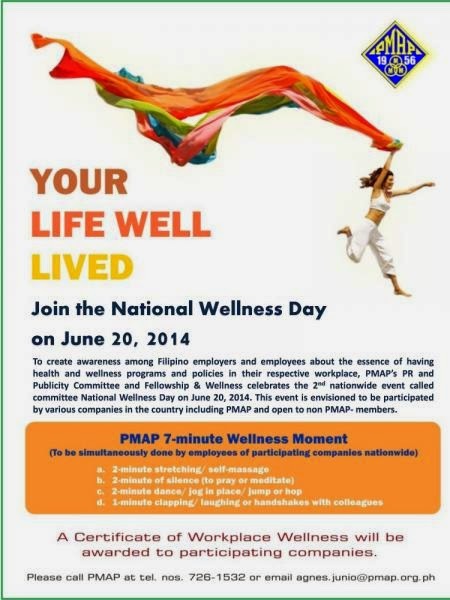 In addition, PMAP is also organizing the National Wellness Summit happening at the SMX Convention Center in Pasay City on August 28, 2014 which will showcase the best corporate best practices on wellness in the workplace, health and fitness activities, company booths and other exciting surprises.